I approached Little Lies with trepidation, I really enjoyed The Husband’s Secret and What Alice Forgot , despite the subject matter in each book being entirely different. but would this long anticipated book match up to my expectations? In a word: yes, so I’m afraid this is going to be another gushing review. 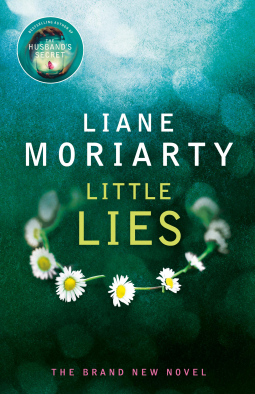 Liane Moriarty creates the most believable of characters even if those characters and these characters are built up in layers through their interactions and the views of other observers; this is my favourite type of story-telling. The story is set around Pirriwee Public School and in particular its fund-raising Trivia Night where someone is dead, but who is left unsaid. Mrs Ponder a kindly retired lady living close by heard the screams that ripped through the night air. Not only is the perpetrator a secret, we don’t know who died either so the mystery is two-fold. As those attending start to recount the months leading up to The Trivia Night to both journalists and police the finger is pointed squarely back to the kindergarten orientation day. Yes, you read that right the trail leads back to something that happened to poor five-year old Amabella, an assault where the aggressor was another five-year old. Renata and Harper attended the same weekly Support Group for parents of gifted children. Madeline imagined them all sitting in a circle wringing their hands while their eyes shone with secret pride. They mean very, very well. They’re like, hmm, what are they like? They are like Mum Prefects. They feel very strongly about their roles as school mums. It’s like their religion. They’re fundamentalist mothers. The pace of the plot is addictive managed by lots of revelations as the veneer of the characters are stripped back to reveal more complexity than initially imagined. This is the second book this week where I have stayed up late to find out what happened next as I read just one more chapter! Despite the children being the background to the plot their characters are distinct, this is not some amalgamation of a random children used for cute effect, they behave randomly as real children do including the teenage Alice who is Madeline’s eldest daughter. “I can’t even speak now!” Alice’s whole body trembled “I can’t even be myself in my own home! I can’t relax!” Madeline was reminded of Alice’s first ever tantrum, when she was nearly three and Madeline had been thinking that she was never going to have a tantrum, and it was all due to her good parenting. Despite giving the previous books I have read by this author 5*’s this book surpasses them both and will be a book I recommend to everyone this summer as it has the right mix of the good read elements: drama, mystery, issues, characters and plot and no, I didn’t guess the ending, in fact I was way off! I’d like to thank the publishers Penguin UK for allowing me to review a copy of this book ahead of the publication date of 31 July 2014. Thank you for this excellent review, Cleo. This is another awesome addition to my TBR list. You really don’t want to miss this one Karen! I have really enjoyed all the ones I’ve read and yet they are all different, to my mind that is a good measure of a great author. Cleo – That’s an absolutely fascinating and important topic. Bullies are not just children, and bullying goes on in the adult world too. I’m glad you thought so much of the book. This book showed many levels of coercion which is really compelling when compared to what happened at the kindergarten. I really loved this, although there were major issues explored the writing style made it a really enjoyable read. Wow! This sounds like a great read. I haven’t read any of her books before but I must start now. Sounds like all of her books are good. I do recommend picking up one of these books. I thought The Husband’s Secret was all hype but both that one and Little Lies are both worth a read. 😆 hmm.. a bit mean wishing me rubbish reads! I LOVED this book…here it was called Big Little Lies, so for a minute, I was confused…LOL. Moriarty is now one of my favorite authors. Thanks for your review. I also had to gush! I read your review Laurel and I concur. I am now going to read some of her older books. I couldn’t resist a gush, one of my favourite reads of this year. Been dying for her new one to come out; she’s proving to be a great new talent. I really thought this was an exceptional read, as you say she has a real talent. You are in for a real treat if you read it. This one is better! I know my star system couldn’t cope!! I’m very tempted to try The Hypnotist’s Love Story because her writing has me hooked. Cleopatra, I finished this book last week, but I wanted to write my own review before I read others. How wonderful we loved it so much! I think everything was perfect: the story, the characters, the crime, the psychological aspects… I am glad to hear Moriarty’s previous works are this good as well. This is definitely one of my favourite reads of the year as it worked on so many different levels – so glad to hear you enjoyed it too. What a great review Cleo! I have The Husbands Secret in the 746 and you’ve convinced me to try it!